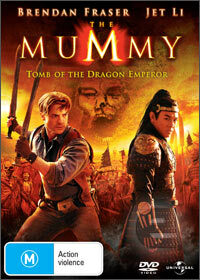 The Mummy 1 = Awesome, The Mummy Returns = Verging on Bad and finally The Mummy - Tomb of the Dragon Emperor = Awesomest! (And yes, that word does not exist!) Ignore the hype, the critics and sit back and enjoy a truly thrilling adventure that makes up for the poor sequel and actually not only compliments the original movie but may even be a tad better. Yes... The Mummy is back! Once again Brendan Fraser revives his role as adventurer Rick O'Connell that is set several years after the sequel and Rick's son Alex is now a grown man. Unfortunately for the world of man, another mummy is unwittingly released and if the resurrected Han Emperor (Jet Li) gains his lost power, the world will be overrun by the undead. Thankfully Rick is joined by his wife Evelyn who is now played by the beautiful Maria Bello, originally in the first two films it was played by the delightful Rachel Weisz and even more interesting is that the movie even makes a gag that she looks different. Evelyn's brother also his reprises his role as Jonathan (John Hannah) who unfortunately has taken a back seat in this movie, however he still has enough one liners to make the movie quite entertaining. Lastly, Luke Ford joins the franchise as Alex O'Connell, the son of Rick and Evelyn. It also seems that Alex O'Connell may be the new star of subsequent movies and he really sits quite well in the role of adventurer and treasure hunter. Story wise, without spoiling things too much, in ancient times the Emperor searched to become immortal, however he double crossed his sorceress (Michelle Yeoh) who turned the Emperor and his army into terra cotta soldiers. Fast forward to the "present" and Alex O'Connell is unwittingly tricked in reviving the Emperor which is where the action starts that is beautifully linked with some state of the art CGI which looks phenomenal. Unlike the previous films that were set in Arabia, this flick is based on the Far East and really lends itself well to the franchise. Definitely a really fun movie that can be watched time and time again! This is what the latest Indiana Jones movie should have been!